Let the designer show you 5-Steps to a perfect ergo set up. By integrating your IT needs, establishing your space planning, and deciding on your preferred adjustment options, combined with any special application needs, you will end up with a perfect Biomorph solution for a healthier and more productive working environment. 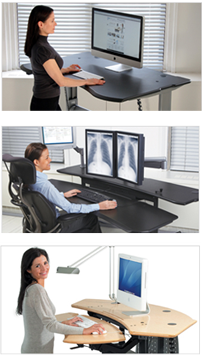 Call us anytime for ergonomics help and product advice at 888 302 3375. 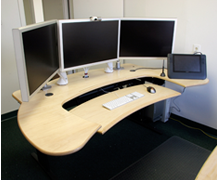 1.The number of monitors will most likely dictate the size of your desk. The more you have the wider the desk. If you get monitor arms you can have them hang beyond the desk footprint. How Many Monitors Do You Use with Your Computer? 2.Measure your space and plan the best layout solution. Corner desks gain more workspace with a smaller footprint. Linear desks work best along walls, freestanding arced desks can float. Don't forget to allow at least 2"-4" of clearance all round for the adjustment needs. 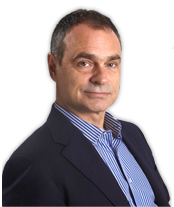 3.Do you want to work standing, as well as sitting? 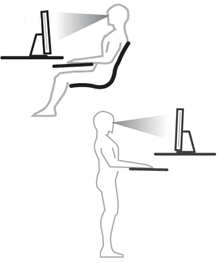 Then choose 'Full Sit-to-Stand' adjustment. If you plan to work only sitting down, then choose 'High Range Sitting Adjustment', this allows good seated adjustment for individuals of all sizes. Motorized adjustment is most convenient for sit-to-stand, but some models also have fast crank drives or spring-loaded mechanisms. Seated adjustment is achieved with cranks. 4.Choose a single surface desk, which should be complimented with monitor arms to allow keyboard surface/monitor differential adjustment, if you like a lot of desk space. Choose a dual surface desk, with individual surface adjustment (some models have a tilting keyboard surface option) for more control over the surface height-adjustment. 5.Choose the application and environment that best reflects your workplace. Each profile will offer solutions tailor-made for that application, but you will always have options to view the whole line.